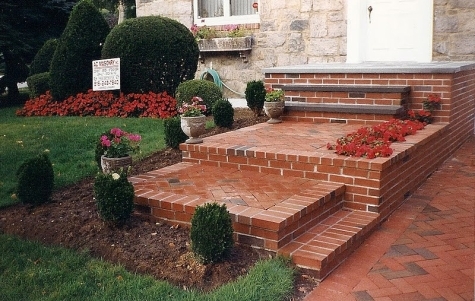 [slider slider_type=”attachments”] Steps and Stoops in Northern VA, DC, and Maryland At Crescent DC we take great pride in our Step and Stoop construction. Please allow Crescent Design & Construction to submit a bid on your project. It’s very simple to start the process…just call or email us and we’ll set up your complimentary in-home consultation and estimate. As you can see in these photos, the same materials used in our walks can be continued throughout your steps and stoop to create many different incredible looks. Brick borders can be used to neatly frame the artwork within. From stamped concrete to irregular stone to rectangular slate to bricks to interlocking pavers to epoxy and river stone, the potential looks are beautiful and endless. Some of the areas that we serve are Arlington County, Fairfax County, Oakton County, McLean, Clifton, Fairfax Station, Great Falls, Oak Hill, Ashburn, Falls Church, Alexandria, and Burke Virginia. We are conveniently located so that we are also able to serve Maryland and Washington D.C. as well. We also install roads, driveways, pools, pool decks, pool lighting, pool accessories, above ground pools, walkways, resurfacing, patio heaters, patio covers, outdoor living, backyard designs, and more.